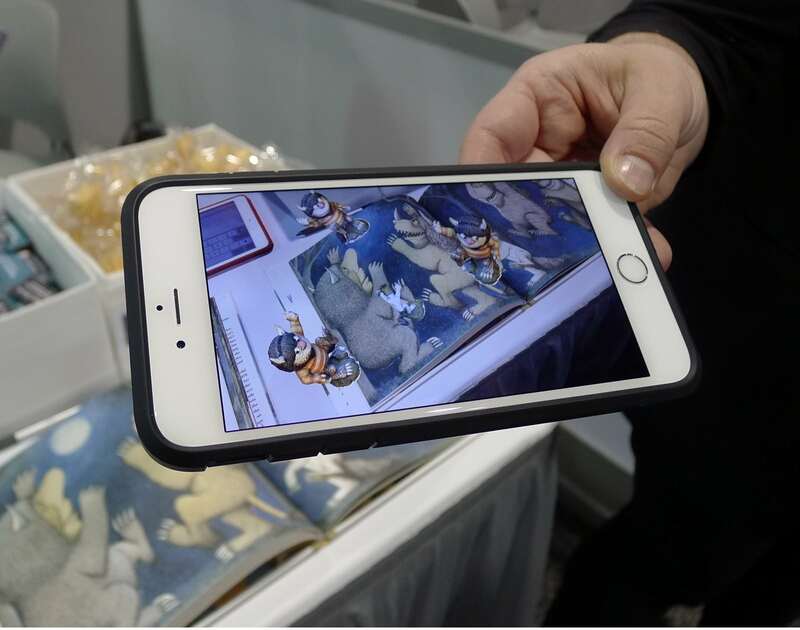 A number of different tech companies have tried to bridge paper and digital by adding augmented reality features to paper books over the years, and now MagicBook is giving it a go. I bumped into this young startup in the Eureka Park, where it was showing off its ideas for an augmented reality children's book. The tech is in the early stages of development, so there wasn't much for me to see, but I can tell you that Magicbook is working on an app-based concept which could be made to work with any book (so long as the digital content exists). All they had to demo was a couple pages made for the classic kid's book, Where the Wild Things Are. In the demo I can make the trees grow in the bedroom, or see the monsters. All that is required for this trick to work is the book, the app running on a camera-equipped smartphone or tablet, and of course the digital extras. That last will likely be a stumbling block for MagicBook; as we've seen from the general non-adoption of augmented reality over the years, few publishers are willing to invest in creating the content. When are these companies going to get it? Reading is…well, reading. Video games are, um, video games. Movies are…well, you get the point. And yet, these start-ups raise millions of dollars in the quest to “build something new”, and at the end of the day, leave their investors in the lurch. The sooner the book industry realizes that they are a true–and sadly, relatively limited–“niche” in the world of entertainment, the sooner they’ll start settling on a money-MAKING future rather than trying to build the next Netflix, the next whatever that ties visual media into the highly-personal experience of reading. I’m happy to be wrong, but I have seen these interactive and value-added ebook concepts come along a few times, and they always vanish with nary a whimper. Maybe there is one, but I can’t think of a net-positive company that has reached the mainstream with any of these things. When it comes to selling books, I think the book industry needs to focus more on the customer experience, QC of the digital books, and marketing, instead of trying to force things consumers clearly do not want. Perhaps the only area I see this kind of thing being valuable is in technical and non-fiction books that would benefit from the judicious use of such technology. But strangely, most attempts in this space seem designed to appear to children. That seems short-sighted to me and not at all visionary–something producers of this kind of content are going to need to be to succeed. Unfortunately (for us, anyway) there is always someone new who doesn’t know that their great idea has been tried 4 times in the past 6 years and failed every time.